This chart shows the number of officials by term in office in December, 1995 and December, 2015. A lot’s changed on the city council during the past 20 years. Ruth Bascom was Mayor and County Commissioner Pat Farr, state Representative Nancy Nathanson, and former two-term Mayor Jim Torrey were all first-term city councilors. For one thing, it’s clear the mayor and city councilors today have been in office a lot longer than 20 years ago. Whereas the mayor and seven city councilors were in their first term at that time only two, Greg Evans and Clair Syrett, are in their first term. Back then, no one had been in office more than two terms. Now, seven of nine are. There could be many reasons. The biggest change in city policy between then and now is that the mayor and city council are now paid. Source of data: Eugene City Recorder. 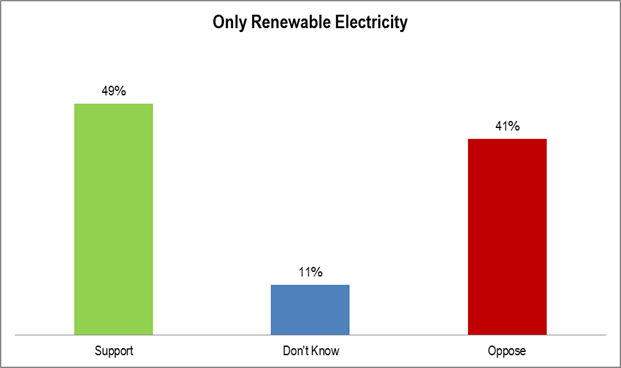 A proposed renewables measure received support that is close to, but still below 50%. 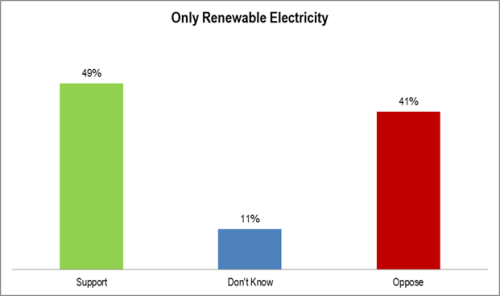 QUESTION: Do you support or oppose a ballot measure increasing percentage of electricity that must come from renewable sources; requires eliminating coal-generated electricity? METHODOLOGY: Live telephone interviews of 400 likely Oregon general election voters were conducted September 14-16, 2015. The margin of error at the sample median is 5%. Quotas were established based on gender, age, party, and region. Totals may not equal 100% due to rounding. 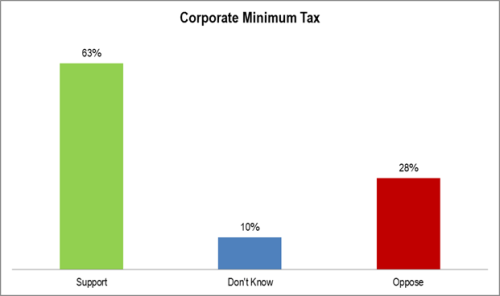 A proposed corporate minimum tax receives more than 60% support statewide. QUESTION: Do you support or oppose a ballot measure increasing the corporate minimum tax when sales exceed $25 million; funds education, healthcare, senior services? 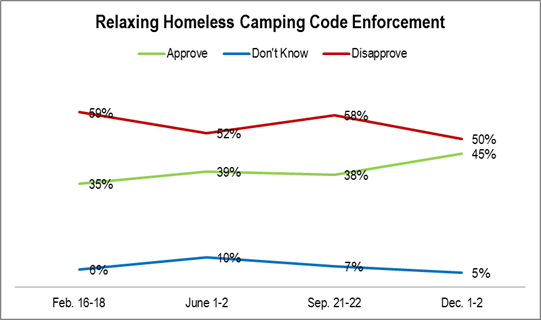 The support for relaxing homeless regulations has been steadily increasing during 2015. QUESTION: Do you support or oppose the City of Eugene relaxing code enforcement on homeless camping? METHODOLOGY: 200 telephone interviews of City of Eugene likely general election voters were conducted the nights of February 16-18, June 1-2, September 21-22, and December 1-2, 2015. The margin of error at the median is 7%. Figures may not add up to 100% due to rounding. 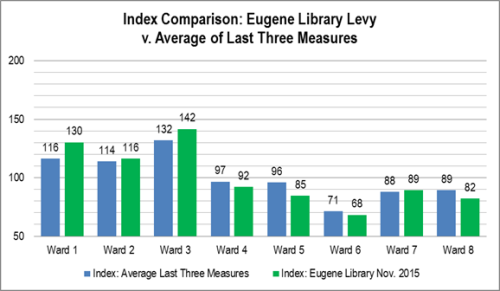 METHODOLOGY: 200 telephone interviews of City of Eugene likely general election voters were conducted the nights of September 21-22 and December 1-2, 2015. The margin of error at the median is 7%. Figures may not add up to 100% due to rounding. The library levy index exceeds the previous average index most in wards 1 and 3 – which were also its best performing wards. The biggest relative drop off occurred in Ward 5. Note that the citywide index is always = 100. The last three measures were the May 2015 Lane Vehicle Registration Fee, the May 2013 Lane Jail Levy, and the May 2013 Eugene City Fee. Here are some interesting polling data though they are from back in the summer. They provide a key insight into how voters perceive various categories of government administrators. In particular, these questions concern how the County Administrator, the City Manager, and the Police Chief are perceived as individual actors in the community. 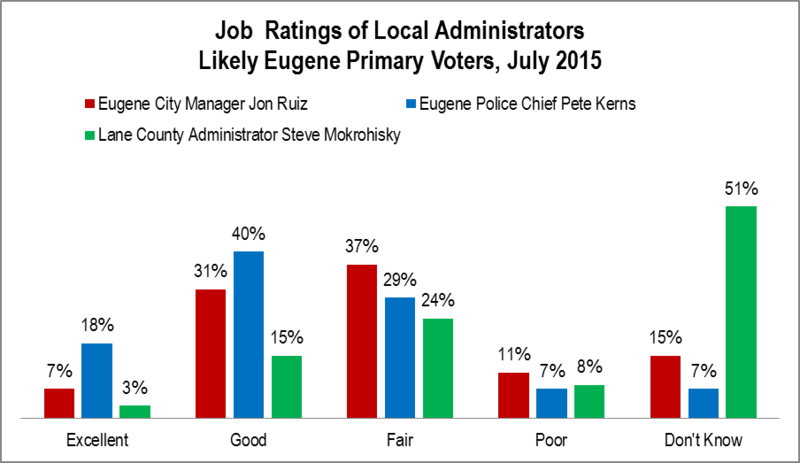 Eugene Police Chief Pete Kerns is rated best. Jon Ruiz is rated reasonably well for a city manager. Steve Mokrohisky is comparatively unknown. These results are exactly the opposite of their relative scope of work: the county is larger than the city which, in turn, is larger than its police department. Obviously, things might have changed between then and now, but the snapshot is still interesting. QUESTION: How would you rate the job _________ is doing: excellent, good, fair, poor? N.B. This only includes unelected administrative officials responsible for a local government covering Eugene. Gino Grimaldi, Springfield City Manager, is obviously not eligible. We hope to cover Mr. Grimaldi at some later date. 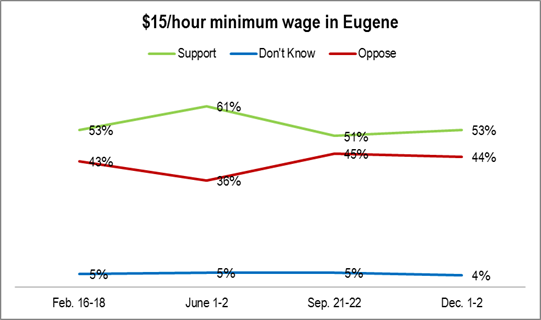 Though it has fluctuated, support for a $15 minimum wage in Eugene has been relatively steady in 2015. 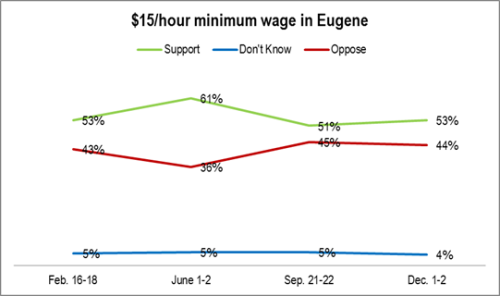 QUESTION: Do you support or oppose a $15/hour minimum wage within Eugene city limits? 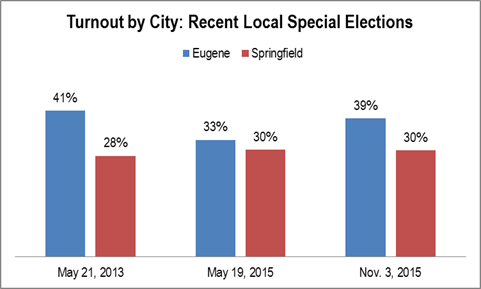 This compares turnout in recent special elections in Eugene and Springfield. Each city’s voters faced at least one money measure on the ballot during each election. Several observations stand out: 1. 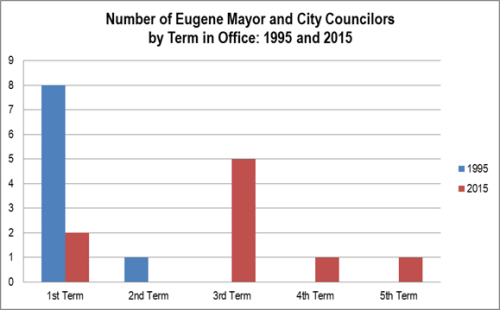 Eugene’s turnout exceeded Springfield’s in every election – sometimes by a lot! 2. Springfield’s turnout has been more stable. 3. Contrary to some reports, this past November’s turnout was not especially low for a special election with money measures. In general money measures drive turnout in special elections. All else equal, the turnout roughly doubles. 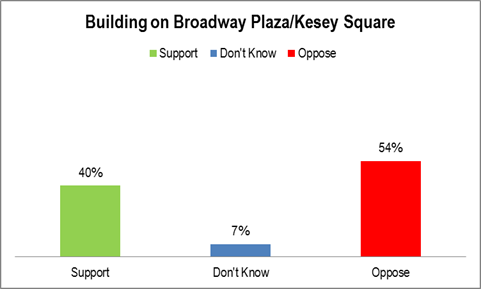 Building on Broadway Plaza is opposed by a solid, but not overwhelming, margin. 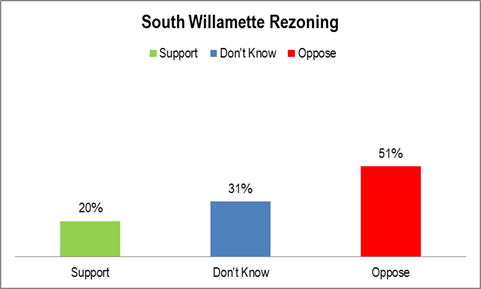 QUESTION: Do you support or oppose building on downtown Eugene’s Broadway Plaza also called Kesey Square.